It is a complex web of legalities, treaties and trade deals that have to be sorted out before the road forward for an EU-free United Kingdom is achieved. Business will only need to adapt to “a new set of rules” at the end of a transition period. That period lasted until December 2020 and then it had the potential to be extended to the end of 2022. What was clear was that the United Kingdom was not planning to hold another referendum. He said there was “not a fear of a second vote”. The view was that the outcome of the vote – which was “narrow but decisive” – should be respected. There was no intention whatsoever that Brexit – the withdrawal of the UK from the European Union – would mean that Great Britain would retreat from the world. Indeed the UK was represented diplomatically in 169 countries. In Africa “we are adding 400 new jobs (to) the diplomatic network,” he said, noting that the intention was to “bolster our trade and investment network” on the African continent. A High Commission was to be set up in Lesotho and eSwatini – served currently by Casey as non-resident commissioner at present. May had signalled the intention for the UK to be the biggest investor in Africa by 2020. “What that means in practice is overtaking the US… (which is) currently number one. The reason we are confident we can achieve that ambitious goal is because that goal is being backed up by new additional resources for the main government instruments used to leverage investment in Africa.” These included utilising the powers of the Commonwealth Development Corporation. The PM had signalled that the vote – the so-called “meaningful vote” – in the UK parliament on the withdrawal agreement would take place before Christmas. Importantly for South Africa and our trading partners around the world, currently applicable EU trade rules would remain in place until the end of the transition period. He argued that Brexit would not be disruptive of relations with the UK’s trading partners around the world. What does this mean for the UK/SA relationship, he asked himself rhetorically. “I personally don’t believe that South Africa or South Africans will have any great difficulty in engaging with the UK outside of the EU. For the great majority of our shared history, the UK was not in the EU… indeed the EU did not exist.” South Africa had a preference to engaging with the UK bilaterally at any rate, he said. Noting that South Africa would be sitting on the UN security council in 2019 and 2020: “For the next two years I will certainly be working here with all the countries that are going to be members of the UN security council…. Both from the European Union and elsewhere for the period of South Africa’s membership.” He predicted that SA would be taking “a fresh approach” to matters at the UN and the Human Rights Council and the Organisation for the Prevention of Chemical Weapons. “We hope to find common ground with South Africa and support a leadership role by South Africa in Africa and globally.” There would be more “continuity” than change in policy with the exception of trade policy. “For the last 45 years while we have been a member of the EU we have been part of the EU’s common commercial policy as well as being members of the EU customs union and latterly the single market.” As such the European Commission was responsible for running the UK’s trade policy. The aim was to avoid any disruption in British trade relations with SA “whatever happens in the Brexit process between the UK and the EU.” There was a “healthy balanced trading relationship” between SA and the UK and the High Commission said he was “well aware” that South Africa was the source of key exports to the UK of goods such as cars, wine, fruit, veg “much of that produced here in the Western Cape”. In practice “that requires us to produce an agreement with out counterparts in SACU (the Southern African Customs Union) which will replicate the effects of the existing EU Economic Partnership Agreement (EPA)”. That covered the member states including SA, Lesotho, Namibia, Botswana, eSwatini and Mozambique which comprised the world’s oldest customs union. “While we are members of the EU we cannot go further than that… and change the terms of our existing relationship… before we leave.” The current arrangements had to be replicated “so there was no gap” when that happened. He reported that bilateral progress was being made on this front. Botswana was leading the negotiations on these matters. Noting that President Cyril Ramaphosa had asked the UK to increase investment in SA, he said that there was “low hanging fruit” in the tourist market. The UK was waiting for the additional requirement by Home Affairs relating to children to be scrapped. 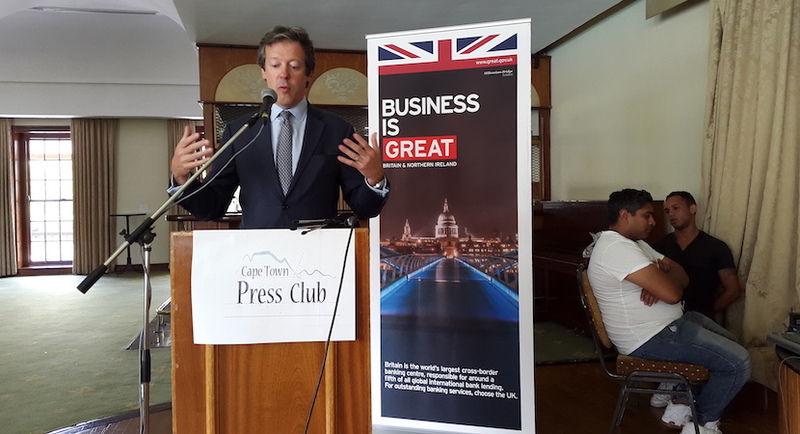 He also personally supported a change in the visa regime of the UK which had altered requirements – high fees now applied – owing to weaknesses which had arisen with non-South Africans using fake SA identities. “If we were able to do away with it … no one would be more delighted than me.” Casey did not refer to the land expropriation without compensation question at all, signalling by his lack of comment that the UK was not deeply concerned that this policy would pan out to be disruptive of the UK/SA relationship. Donwald Pressly is a longstanding political and economics journalist. He covered the SA parliament for 25 years during which he focused on matters of SA trade policy and inter-governmental relations.